Niteshift will be offering passes to a November 27th screening of The Collection at the AMC Empire 25 in Times Square. Tune in to 99.5 FM WBAI, next Monday for details. The Collection will be in theaters on November 30th, 2012. From the writing-directing team Marcus Dunstan and Patrick Melton (Saw IV, V and VI) comes The Collection, a suspense horror film with nonstop thrills at every turn. Directed by Dunstan and starring Josh Stewart (The Dark Knight Rises, The Collector), Emma Fitzpatrick (The Social Network) and Christopher McDonald (“Boardwalk Empire,” Requiem for a Dream), the film centers on a traumatized man forced to help rescue a beautiful woman who has become the latest obsession of a crazed killer who “collects” humans in a booby-trapped house of horrors. When ELENA (Fitzpatrick) is talked into attending an underground rave party with her friends, she finds herself caught in a nightmarish trap where the revelers are mowed, sliced and crushed to death by a macabre series of contraptions operated by a masked psychopath. When the grisly massacre is over, Elena is the only survivor. But before she can escape, she is locked in a trunk and transported to an unknown location. Fortunately for Elena, one man—ARKIN (Stewart)—knows exactly where she’s headed, having just escaped from there with his life and sanity barely intact. Going back is the last thing on Arkin’s mind, but Elena’s wealthy father (McDonald) hires a crack team of mercenaries to force Arkin to lead them to the killer’s lair. But even these hardened warriors are not prepared for what they encounter: an abandoned hotel-turned-torture-chamber, rigged with deadly traps and filled with mangled corpses. Can Arkin and the team get to Elena before she too becomes part of his gruesome “collection”? Niteshift will be giving away passes to a special theater presentation of Star Trek: The Next Generation – A Celebration of Season Two courtesy of Fathom Events and CBS Home Entertainment. Tune in to 99.5 FM WBAI, Monday at midnight for details. Star Trek: The Next Generation – Season Two can be pre-ordered right now at Amazon.com. To celebrate Season 2 of the iconic series Star Trek: The Next Generation, NCM Fathom Events and CBS Home Entertainment are coming together again for a special one night big screen event. This not to be missed movie theatre event will feature two of the most popular Next Generation episodes,Q Who? and The Measure of a Man which will include, for the very first time, about 13 minutes of never before additional content. This special event will also include exclusive looks at the extensive restoration taken to make Season 2 look better than ever before, never-before-seen interviews with the original cast members, a behind-the-scenes look at the artists who created the original FX elements and photography and a reunion with the original cast members, captured in December 2011, as they celebrate 25 years of this unforgettable series. 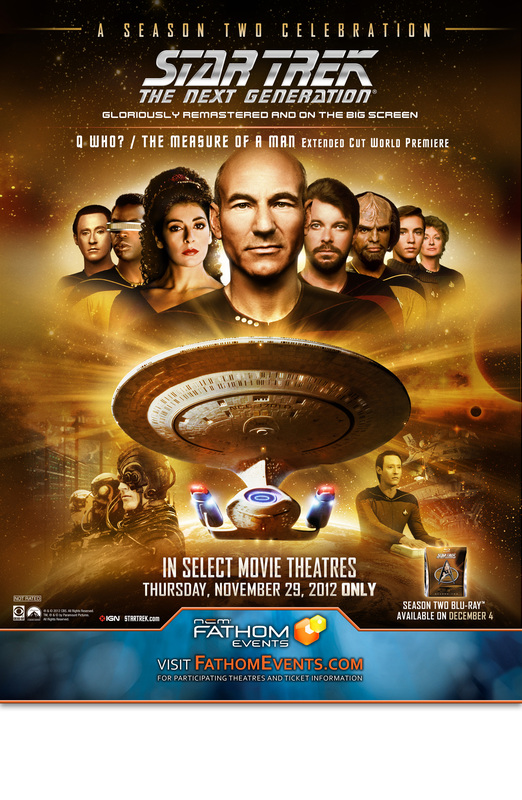 Star Trek: The Next Generation – A Celebration of Season 2 is the first opportunity to see a transcendent digital presentation and the world premiere of the extended cut of TheMeasure of a Man in select movie theaters nationwide on Thursday, November 29th at 7:00 PM. To purchase tickets, click here for a list of participating theaters. OVERVIEW: Classic Grimm’s fairy tales come to life like never before in the “dark and imaginative” (Mike Ayers, CNN.com) supernatural series “Grimm,” from the producers of Buffy the Vampire Slayer and Angel. Homicide detective Nick Burkhardt (David Giuntoli, “Privileged,” “Grey’s Anatomy”) discovers he is descended from a long line of criminal profilers known as “Grimms,” protectors who are charged with keeping the balance between humanity and the creatures of myth. With newly awoken abilities to detect the evil lurking among us, Nick struggles to keep his old life separate and safe as he becomes ever more entrenched in the ancient rivalries of the Grimm world. Available on Blu-ray™ and DVD on August 7, 2012, “Grimm” Season One allows fans to experience all 22 chilling episodes back-to-back and uninterrupted. “The Mentalist”), Bitsie Tulloch (The Artist, “Quarterlife”), Reggie Lee (“Prison Break,” Pirates of the Caribbean: At World’s End) and Sasha Roiz (“Caprica,” “House”). Guest stars such as Mary Elizabeth Mastrantonio (Scarface) Amy Acker (“Angel”), Titus Welliver (“Lost”) and Sebastian Roché (“Supernatural”) also appear in this uniquely evocative series that critics rave “offers genuine scares” (Michelle Tauber, People). “Grimm” Season One is available as a five-disc set in special, limited edition packaging with exclusive “Grimm” collector cards. It features never-before-seen bonus material that takes fans deep into the world of “Grimm,” including an interactive creature guide, “Making Monsters” featurette and much more. The “Grimm” Season One Blu-ray™ also features perfect hi-def picture and perfect hi-def sound. GRIMM GUIDE: An interactive book that provides insight into the various creatures featured in the show. THE WORLD OF GRIMM: Get to know the characters and creatures that inhabit the world of “Grimm” and discover the inspiration behind the storylines. Season One of “Grimm” is coming to DVD and Blu-Ray on August 7th, but Niteshift fans will have a chance get their copy a week early. We’ll be giving away “Grimm” Season One on Blu-Ray and a Blu-Ray player tonight courtesy of Universal Home Entertainment. Tune in to WBAI 99.5 FM tonight at midnight for more details. 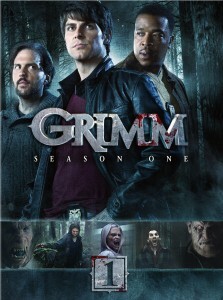 “Grimm” Season One is available for pre-order right now at Amazon.com. Season two of Grimm premieres on Monday, August 13th on NBC. Classic Grimm’s fairy tales come to life like never before in the “dark and imaginative” (Mike Ayers, CNN.com) supernatural series “Grimm,” from the producers of Buffy the Vampire Slayer and Angel. Homicide detective Nick Burkhardt (David Giuntoli, “Privileged,” “Grey’s Anatomy”) discovers he is descended from a long line of criminal profilers known as “Grimms,” protectors who are charged with keeping the balance between humanity and the creatures of myth. With newly awoken abilities to detect the evil lurking among us, Nick struggles to keep his old life separate and safe as he becomes ever more entrenched in the ancient rivalries of the Grimm world. Available on Blu-ray™ and DVD on August 7, 2012, “Grimm” Season One allows fans to experience all 22 chilling episodes back-to-back and uninterrupted. Filed Under: News by J Bennett — Comments Off on Mike Sargent to Moderate “The Ministers” Talk-Back on April 20th! The Metropolitan Arts League is pleased to announce that Mike Sargent, Writer/Director/Film Critic, will be moderating the Talk-Back with Writer/Director Franc. Reyes and some members of the cast of The Ministers at the Yale Club of NYC on Wednesday, April 20th, 2011. Visit Metropolitan Arts League Events page for details and to purchase tickets. Niteshift Live on USTREAM Starting April 19! Filed Under: News by J Bennett — Comments Off on Niteshift Live on USTREAM Starting April 19! Beginning April 19 at Midnight, Niteshift will be streaming video live from the WBAI studio on Ustream.tv. You can watch the show every week at http://www.ustream.tv/channel/niteshift1, or by clicking the “Live Video Feed” button on this site. KCCS is hosting a special screening of the 1999 film PERSONALS featuring a Q&A with director Mike Sargent. Details: Wednesday April 13. 8pm: music from the soundtrack played. 8:30 film. 10:15 Q&A/workshop with director. via Kings County Cinema Society. Composer John Barry, who won five Oscars for his film work but was best known for his contributions to a dozen James Bond movies, has died. He was 77. The English-born composer won two Oscars, for the score and the song, for “Born Free” in 1966, and he earned single statuettes for “The Lion in Winter” (1968), “Out of Africa” (1985) and “Dances with Wolves” (1990). Facebook in Online Privacy Breach; Applications Transmitting Identifying Information – WSJ.com.